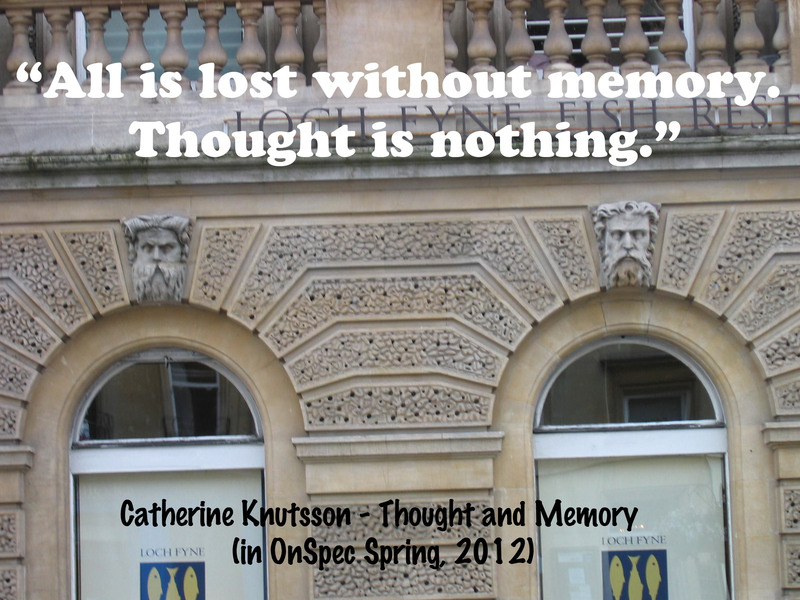 A review of “Thought and Memory” by Catherine Knutsson. In On Spec Vol. 24, No. 1, Spring 2012. Catherine Knutsson’s Thought and Memory expands on a line from the Norse “Sayings of Grimnir” in which Odin discusses his two ravens Huginn and Muninn (Thought and Memory) and expresses his fear that the ravens may be lost. Knutsson portrays Odin as an old man who has been hospitalised and has lost both Thought and Memory: both the birds, and his actual thoughts and memory. The story serves as a metaphor for old age and the fear of Alzheimers and dementia, and it postulates the idea that although our society tends to ignore the elderly and abandon them to the world of the medical, the life and death of even one old man IS significant and world-shaking. It suggests that there is more to age than the medical profession and the perceived burden on society and instead suggests that the elderly are a receptacle for the mythical, important story-tellers that are the key to social memory. Odin, like many symbols of heritage, is lost in modernity. While his ravens search for Odin, the world grows cold and people begin to die. The Norns weave their own hair to try to keep the thread of life continuing and trying to prevent the freezing touch of Ragnarok. This short story makes a connection between Canadian fears of uncontrolled ice and the Norse terror over ages of ice. Knutsson makes the pagan very real and modern, playing with a system in which so many issues of the past are lost to the march of progress. Knutsson speaks to the idea that the world itself is forgetting, that we are divorcing thought from memory and the repercussions of modernity’s quest to think only of the future. The results are the loss of the natural, the coldness of science without history or the human, and an amnesiac world in which actions are divorced from their consequences. As Knutsson suggests, the loss of memory really is the loss of everything. You can check out On Spec’s website at www.onspec.ca and find out more about this story. Visit Knutsson’s website at http://www.catherineknutsson.com/ for more information on her upcoming projects.